It's hard to believe that it's been 20 years since Patagonia released it's first fishing vest. This past Thursday a new component to the Patagonia Web site was launched. 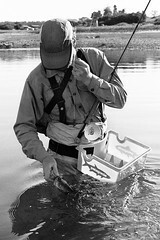 The fly fishing category pages have been revamped (www.patagonia.com/flyfishing) so that systems, products, stories, links and more are easier to find and research. The now-famous "Running Down the Man" video about surf fishing for roosterfish in Baja is hosted on the fly fishing landing page (watch this if you haven't already; it's a slicker version of what premiered at last year's Fly Fishing Retailer show). Check out the site and let me know what you think. Glad to see a more in-depth fly fishing section on the site, thumbs up on putting the skanorak jacket in the striper section, that jacket is pretty rad. I would love to see more photos under each section (i.e. stripers, steelies, etc.) and possibly some good tales to go with it. Site looks good. Wicked cool video. Why did I think of fishing with Henry while watching it? Glad you are happy with the new web diggs Ketan. Your suggestions have been noted. Look for updates on the next "refresh". Bob, I know exactly why you thought of HB. Glad you like the site too. Superb new flyfishing landing site at www.patagonia.com. Lots of stuff there that I had not considered for fly fishing. I can now justify fly fishing as an elaborate form "cross training." Glad you like the site TB. What styles in particular had you not considered for fly fishing? I like what you did EP with the site; good to see the fly fishing section getting the same emphasis as the other sport sections.